A huge part of any system administrator’s job is working out how to make their job faster and easier. This is book to help you do that. 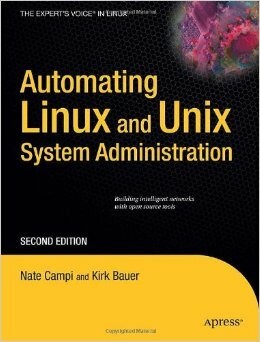 Automating Linux and Unix System Administration helps system admins program and utilize CFEngine to automate grunt tasks and free up your time to do other more important (and more fun) things. While the book focuses most on CFEngine, there are smaller chapters on SSH and Nagios. The book aims to teach readers how to set up a Linux network in the real world (not in the perfect theoretical world), understand core admin best practices, how to make changes repeatable and easy to reverse, and how to make interactions go smoothly, the first time through. What really sets this book apart is that in addition to actionable code examples, it covers the methodology of building an infrastructure for task automation. It’s aimed at anyone who works with Linux servers, at the server or the datacentre level. Campi and Bauer aim to help people create repeatable, secure infrastructure. For beginner developers and systems administrators, there are a few chapters on things like SSH, sudo, and lots of useful Unix tools. More experienced folks will benefit from the large CFEngine chapters as the book works to break what the complicated processes into bite-sized pieces. That said, Automating Linux and Unix System Administration is definitely more geared towards the experienced end of the spectrum, given its focus on CFEngine. All in all, for those working to make their lives easier on a daily basis, especially those with some experience with Linux and UNIX systems, Automating Linux and Unix System Administration is a fantastic buy. © 2019 Linux Hosting. All rights reserved.